CARACAS - Venezuela is producing less oil every day with 1.6 million barrels per day, or nearly half when the so-called “eternal Commander” became President in 1999. The information is official, and it comes from OPEC itself. Venezuela is producing less oil every day with 1.6 million barrels per day, or nearly half when the so-called “eternal Commander” became President in 1999. The country is in compliance with the last reduction in production agreed by OPEC, something being taken advantage of by, among others, one of chavismo’s new best friends: Russia. At the rate things are going at PDVSA, OPEC won’t have to agree upon any further reduction in the production of crude oil, since the excellent management of the country’s main industry by chavismo makes it unnecessary. In this case, the tall tale of an “economic war” is even more false than in the rest of the economy. Oil is in the hands of the State from the pumping process to final production at refineries. Venezuela’s oil industry was first nationalized in the 1970s and “renationalized” by chavismo. In addition, it was placed at the service of chavismo according to the own words of former oil minister and PDVSA president Rafael Ramírez, who also was a longtime supporter of the leftist political movement until recently. 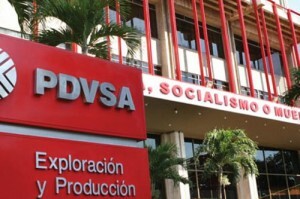 PDVSA was able to hold on a little longer, because there are still capable people among its staff who have managed to endure and to slow the progress of disaster, but in the end they could not prevent it. Worst of all is that Nicolás Maduro cannot think of another solution than that of putting an army general at the helm of the company. This decision is going to deliver the final blow to PDVSA.